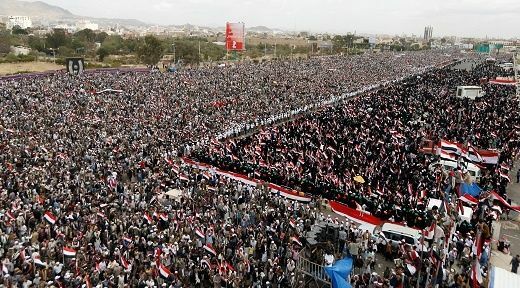 On Sunday, hundreds of thousands of Yemeni citizens poured into capital city of Sana’a to mark the second anniversary of Israel’s proxy war in Yemen fought by the US and its poodle regime in Riyadh. The leader of Yemen’s Houthi movement, Sayyed Abdul-Malik Badreddin Houthi said in statement that the US-led war on Yemen to install a pro-Israel regime in Sana’a has failed. He stressed that while Saudi Arabia has been relentlessly attacking the country, the kingdom has not reached any of its goals. The root of the aggression, he said, is Saudi Arabia serving Israeli interests, as well as US hegemony in the region. “Yemeni people reject U.S. hegemony as they show hostility to the Zionist entity and voice support to the Palestinian cause,” Sayyed Houthi said in the televised speech Saturday. Houthi Shi’ite Ansarullah movement leader also said that the kingdom’s almost-daily airstrikes against civilians in Yemen are nothing short of war crimes, seeing as Saudi Arabia is using the most lethal armaments. The US-Israel-Saudi Arabia war against Yemen began in March 2015 in an effort to reinstate the toppled US poodle president Maj. Gen. Abd Rabbuh Mansour Hadi. Yemen’s Legal Center of Rights and Development announced on Saturday, that the war has thus far killed over 12,040 Yemenis and left more than 20,000 others wounded. Washington and Tel Aviv have been accusing Iran of interfering in Yemen’s internal affairs long before the Houthi rebellion against pro-Western regimes in Sana’a. Both Tehran and Sana’a have refuted the fake news. Yemen has a great strategic importance to the Zionist entity for its shipping to foreign countries via Sea. Yemen also served Israel as source of human-trafficking. Last year, the Zionist regime acknowledged the sale of 5,000 Yemeni Jew babies in the 1950s. On March 26, Jew-billionaire Jeff Bezos-owned Foreign Policy magazine reported Trump administration plans to sell more deadly arms to Riyadh in order to continue its aggression against Yemen in future. “Several Defense officials told Foreign Policy the prospect of more American help for the Saudi-led coalition in Yemen was under discussion even as the administration examines its broader strategy in the region, including looking at ways to counter Iran. The Pentagon views increased support for the Saudi-led coalition as one way of potentially pushing back against Iran’s influence in Yemen, as well as shoring up ties with an ally that felt neglected by the previous administration,” wrote the magazine. Regime changes in Yemen, Syria and Iraq are meant to eliminate Iran’s growing influence in the region. If the Western plan succeed, as mentioned in the notorious Oded Yinon Plan – it will eliminate a future threat to the Zionist cancer in the Middle East. On February 3, 2017, British journalist Brian Whitaker debunked White House lie about Iran attacking a US war ship in order to set the stage for a US-NATO attack on Iran to please Israel and Saudi Arabia. Praises to the Yemenis for their faith & resistance. The satanic trifector is failing miserably. The Yemenis are in the line of “Live like Ali, Die like Hussein” in the face of these satanic oppressors.